Wesley Wong (right) stars as Cadet Jinhai in PACIFIC RIM UPRISING. ©Universal Studios. It’s been a good ride for Wong in his short time as an actor in China. 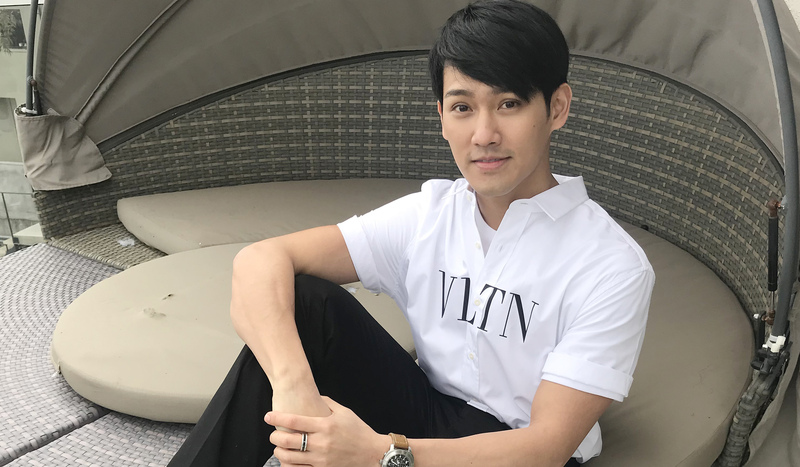 Being the son of renowned Hong Kong actors, he’s been dubbed “the most handsome second-generation star,” according to Asia One. Since making his film debut in 2013, Wong is now in one of the most highly anticipated Hollywood films of 2018, “Pacific Rim Uprising,” directed by Steven S. DeKnight. 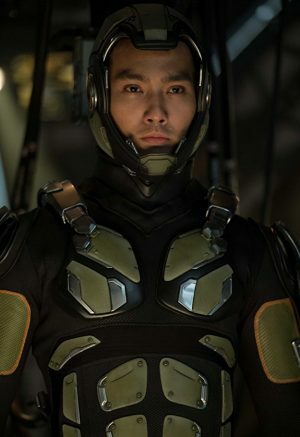 In the action-packed film, Wong plays a Jaeger pilot cadet named Jinhai who is part of the new generation of pilots led by Jake Pentecost (John Boyega) and Mako Mori (Rinko Kiikuchi) who must come together to fight a new menace from the Kaiju monsters. We caught up with him at the Los Angeles premiere of the action-packed monster movie sequel. Q: How does it feel to back in Los Angeles? Wong: It feels great to be back in Los Angeles because I did my undergrad here at USC studying business. Q: If you didn’t speak Mandarin before, was it Cantonese you spoke? Wong: Cantonese and English because those are the two main languages spoken in Hong Kong. Q: In China, the primary language is Mandarin, right? Wong: Yes. That’s the main language in China but there have other languages including Cantonese and other dialects of Chinese. Q: You graduated college and you went to the Beijing Film School. What was that one thing that made you want to get into acting? I was actually pretty honest with him. I really didn’t know. I asked him what he would do. He actually studies here in the States also as a pharmacy tech but went back to Hong Kong and became an actor. Now he’s a lawyer. He said that the most fun or good time in his life was when he was an actor. He said maybe I should give it a try as well. Maybe. Since I was a kid I liked film. But I never had the thought of being an actor or being in the film industry. So, I told him maybe I should study film and that’s how I went to Beijing and got into the film academy and studied acting. That’s how it all fell into place. Wesley Wong. ©Pacific Rim Photo Press/Pacific Rim Video. CR: Steven Lam. Q: Your mother also is an actress. Did that give them the open mind of you going into film or acting? Wong: Actually, I think they didn’t want their career to affect my decision. Since I was a kid, they didn’t take me a lot to the set or to see what they were doing. They wanted me to have a normal life as a kid. Q: What was the first film you did that got you more excited about acting? Wong: Well, actually being part of the film academy, it gave me the chance to with a lot of other people in the different departments in the school. We did a lot of short films so that was a good prep for me into landing a role in a movie. But the first movie I actually did was a remake of a Korean TV drama which was really successful back in the day called, “Sorry, I Love You.” This Chinese company bought the rights of this TV show and made it into a film. That was my first role in a movie. That was a pretty eye-opening experience because we shot in Beijing then they flew to Vancouver and we shot there as well. Q: What was your first English-language film? Q: Were you hoping then that you would get it? Wong: Well, it was my first time to self-tape for a Hollywood movie. Luckily, my manager had experience in it. She actually taped it for me. Q: What was your first reaction when you found out you got the part? Wong: Actually, I was calm when I first got the message from my manager. I didn’t jump up or anything or go crazy. But then the message sunk in that I got the role. Q: Tell us a little bit more about your character? Wong: I play one of the cadets. We are Jaeger pilots as well but then we’ve never been in the war or out on the streets fighting the Kaijus. We’re just a bunch of young Jaeger pilots in case one day the Kaijus come back to fight us. I’m a Chinese cadet called Jinhai. He’s more familiar with the Shatterdome, the place we stay at because it takes place at the Shatterdome in China. Being a Chinese cadet, it’s half his home and then Jinhai’s parents are Jaeger pilots. He’s grown up knowing about the Jaeger pilots and wanting to be a pilot all is his life. When new faces come in to the group, like the female lead Amara (Cailee Spaeny) does, he comes up to her and greets her. Q: How was it working on set? Wong: Steven (s. DeKnight, the director) has always been nice friendly person. I’ve never met a director who is so patient and so passionate and so enthusiastic about his work, so working with him was like a breeze. He’s very knowledgeable and knows the whole process of filming. He knows every character in and out. He knows the story in and out. He’s been working on it for years. It was very fun working with him. Q: What about the other cast members? Wong: I was closest with the cadets because that’s who I had the most scenes with. We actually trained together literally for six months during shooting. We develop a strong relationship like we were actually cadets. When we went to China for portions of the shooting, it was the first time for some of them to be in Asia. I took them out to Beijing and Shanghai to show them around. They had a good experience. It was pretty fun for them as well. Q: This is considered your first major Hollywood film and English language film, what have you learned from it? Wong: It’s probably the biggest budget film I’ve ever been in. It was very eye opening. The technology, experience and how well planned the production was. Since day one, they had everything all planned out. We saw all the storyboards and all the shots planned out. Every team from the stunt team to the costume department were tops in what they were doing. Just working with the production team was very fun. Wong: I’m working on a TV drama in China so I just took a break to come to Los Angeles for the premiere here for “Pacific Rim Uprising.” After that, I’m going to go straight back to China for the TV drama. At the end of the year, we’re in talks with another Hollywood Chinese co-production sci-fi movie which I’ll be the lead in. Q: What do you want to say to your current fans and new fans? Wong: I hope you like what I do as an actor and I hope you like my films. I will continue to work hard to create more different character.